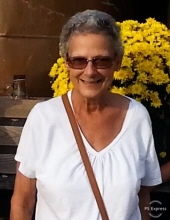 Brenda Hensley, wife of Jack Hensley, age 62, passed away on January 24, 2019 at St. Joseph Hospital in Nicholasville. Brenda was born January 24, 1957 in Hamilton, OH to the late Royal and Jennie Campbell Dawson. Aside from her parents she was preceded in death by a brother Joseph Dawson and a brother in law Mark Hensley. Brenda who adored her children and grandchildren is survived by her husband Jack; daughter Jennifer (Kurt) Hesselbach and son Jackson (Heather) Hensley;grandchildren Courtney, Amelia, Aedyn, Sebastian, Oliver and Alec; siblings Faith Dawson, Melanie Craft, Robert Dawson, Roy Dawson, Jeffrey Dawson and Keith Dawson;sisters in law Debbie Sidwell, Anna Cornett, Von Neff and Donna Hensley; brother in law Michael Hensley. Services for Brenda Hensley will be held on Tuesday January 29, 2019 at 2:00 PM at Clark Legacy Center-Brannon Crosssing in Nicholasville. The family will receive visitors immediately following the service from 2:30-5:00 PM. In lieu of flowers contributions can be made in memory of Brenda Hensley to the American Cancer Society. To send flowers or a remembrance gift to the family of Brenda Sue Hensley, please visit our Tribute Store. "Email Address" would like to share the life celebration of Brenda Sue Hensley. Click on the "link" to go to share a favorite memory or leave a condolence message for the family.